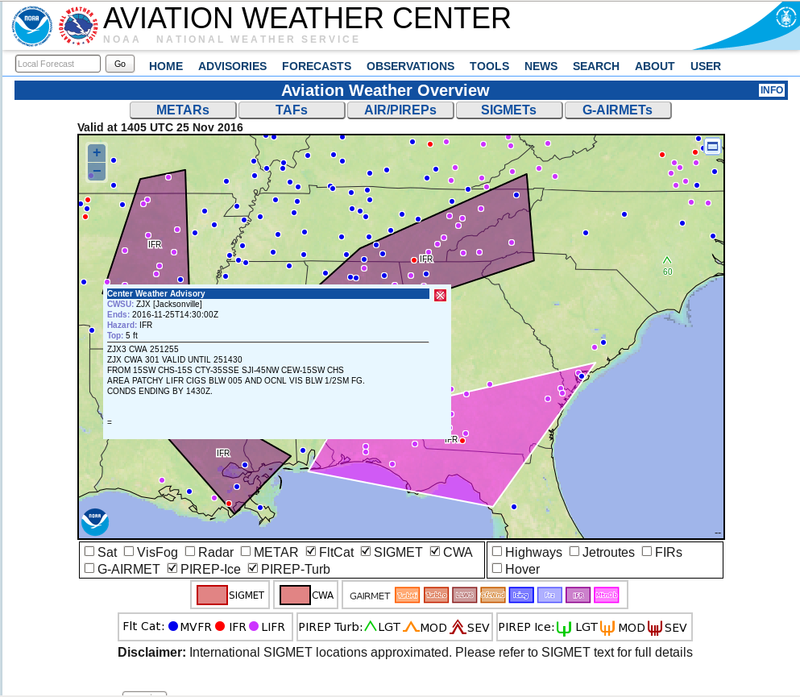 Reduced visibilities and lowered ceilings — IFR and Low IFR conditions — occurred over a wide stretch of the southeastern United States on the morning of 13 June 2017. The animation above shows enhanced IFR Probabilities aligned northwest to southeast from central Alabama to northwest Florida, the region where IFR Conditions develop. 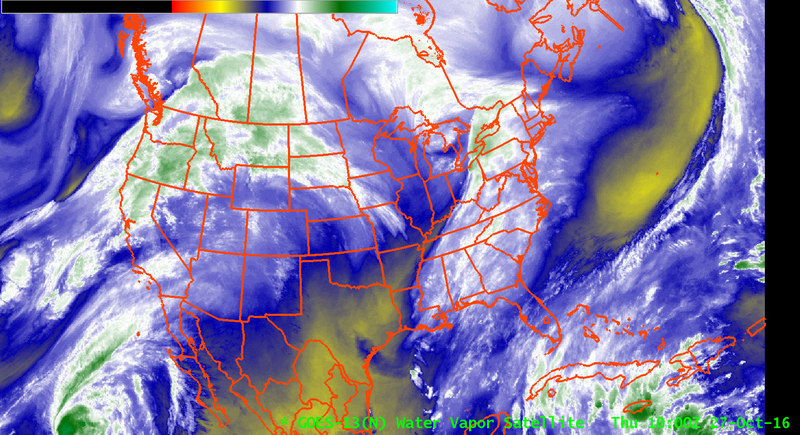 The flat nature of the field suggests that satellite data are not widely available as a predictor for low clouds on this morning, and that is because of widespread cirrus clouds over the southeastern United States (Click here to see the 0545 and 1300 UTC GOES-13 Water Vapor Imagery with cold brightness temperatures over the southeast). 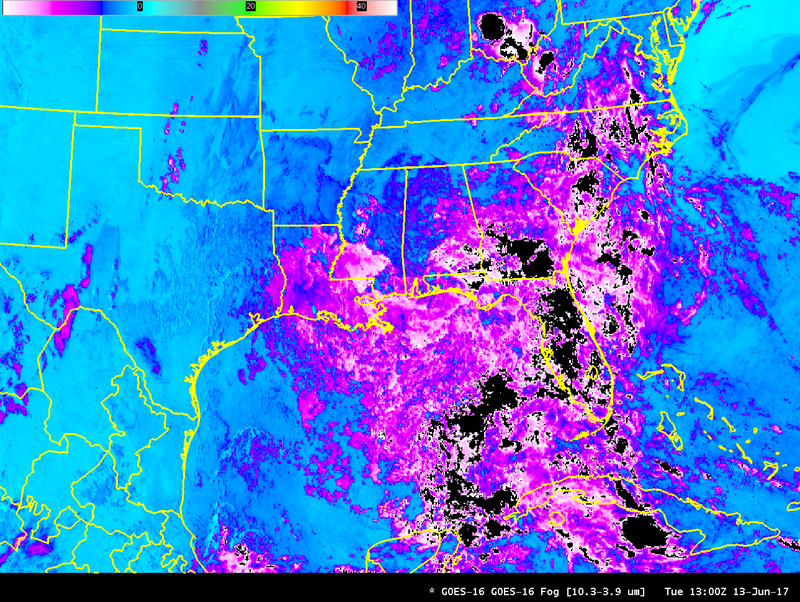 When high clouds are present, satellite-only detection of low clouds is not feasible. 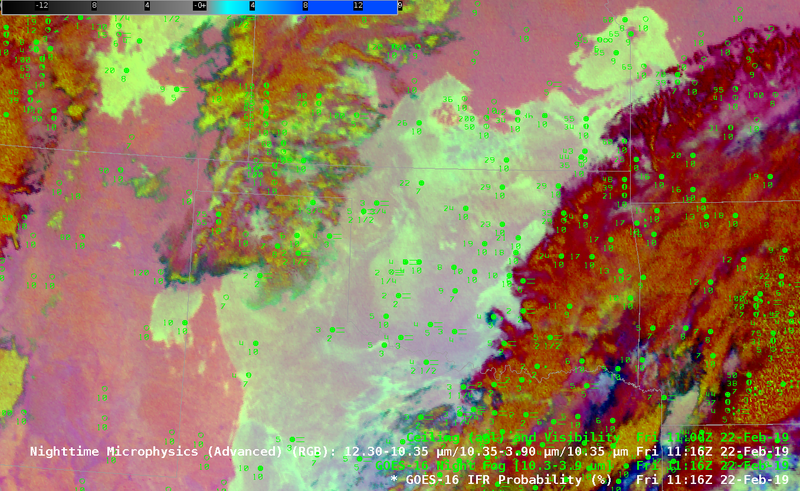 For example, the brightness temperature difference field from GOES-13 (3.9 µm – 10.7 µm), below, has little predictive value for the northwest-to-southeast-oriented feature of low clouds/reduced visibilities because cirrus clouds are blocking the view. Various other detection techniques that rely on only satellite data similarly will be challenged by the presence of high clouds. 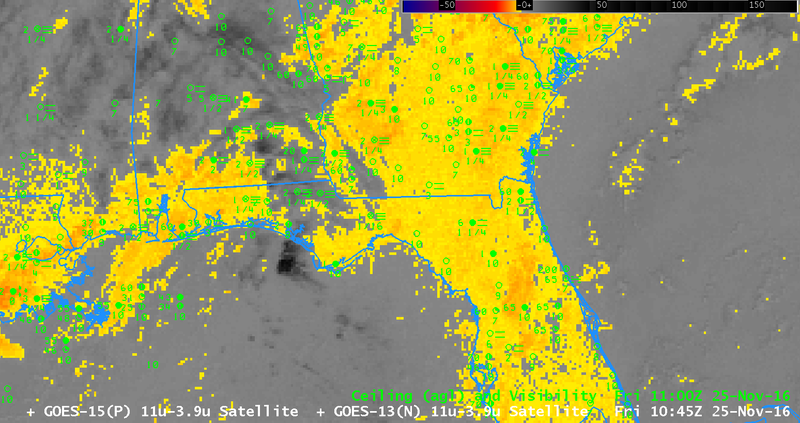 For example, the Nighttime Microphysics RGB (From this site) shows little signal of fog (cyan/white in the RGB composite) over Georgia and Florida. Intermittent signals will appear occaionally as high clouds thin to allow the low-cloud signal through. The GOES-16 Brightness Temperature Difference field (10.33 µm – 3.9 µm) similarly is challenged by the presence of high clouds. 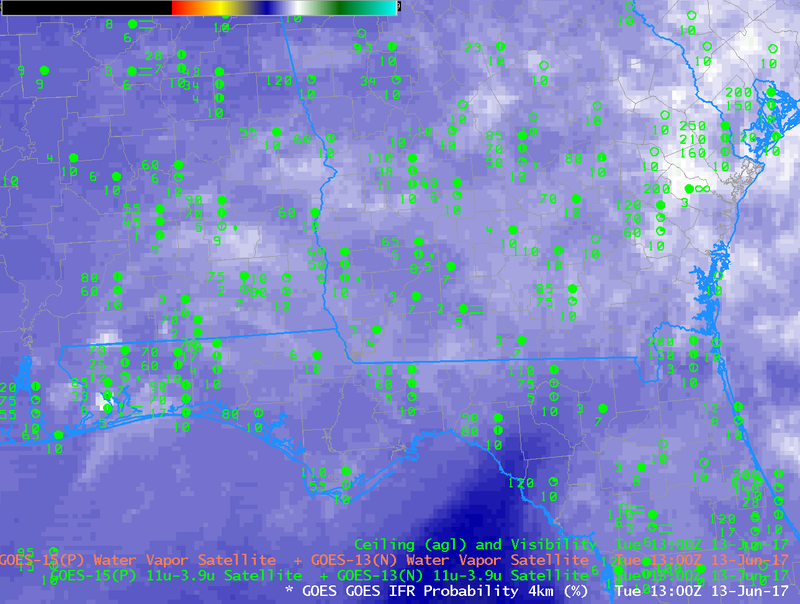 The example shown at 1300 UTC shows a negative value because of reflectance off of high clouds. Because the IFR Probability fields include surface information in the form of output from the Rapid Refresh model (saturation in the lowest part of the model is used as a predictor for the presence of fog), IFR Probability fields can fill in regions where satellite data cannot be used to detect low clouds because of the presence of high clouds. In regions where high clouds are present, satellite-only detection of fog and low stratus will always be a challenge. This entry was posted in Multiple Cloud Layers, Southeast on June 13, 2017 by Scott Lindstrom. 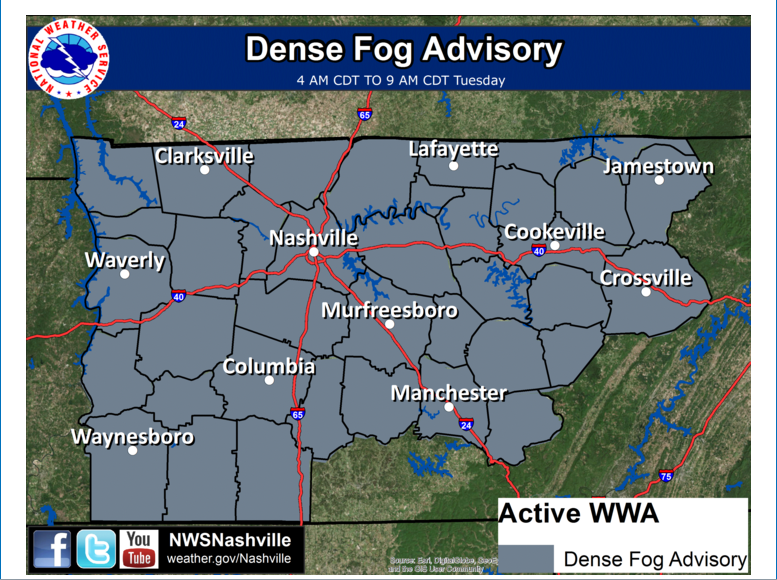 Dense Fog Advisories were issued over the Tennessee River Valley on Tuesday 25 April. 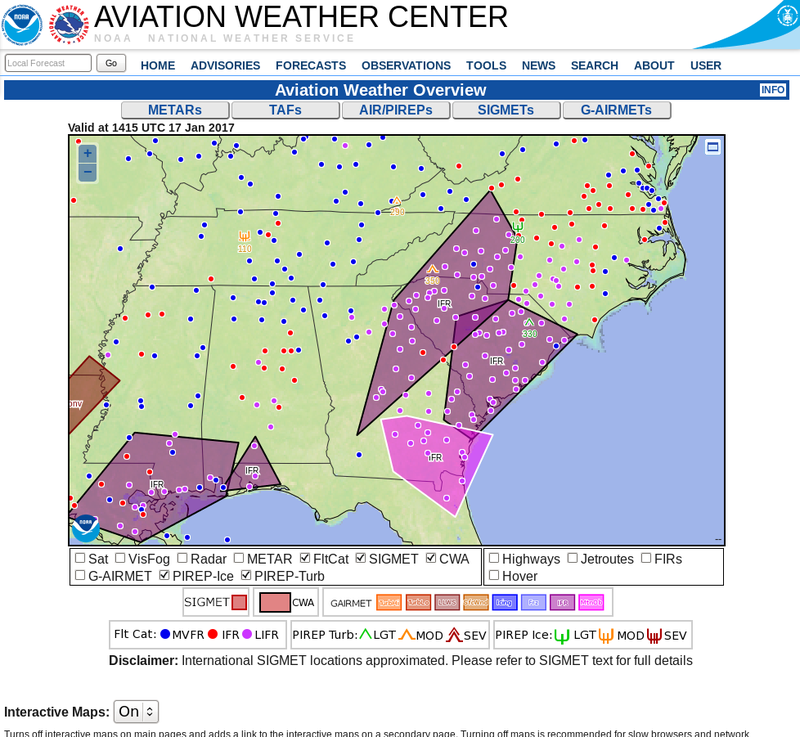 The National Weather Service Aviation Weather website highlighted the regions of IFR conditions shortly after sunrise. IFR Probability fields, above, showed a slow increase in probabilities as ceilings and visibilities lowered during the night. The field outlined the region where IFR conditions were developing/occurring, meaning that it was a good situational awareness tool as the fog developed. Brightness Temperature Difference fields, below, have historically been used to detect low clouds and by implication, fog. Clouds composed of water do not emit 3.9 µm radiation as a blackbody in contrast to their emissions of 10.7 µm radiation that are more like that of a blackbody. 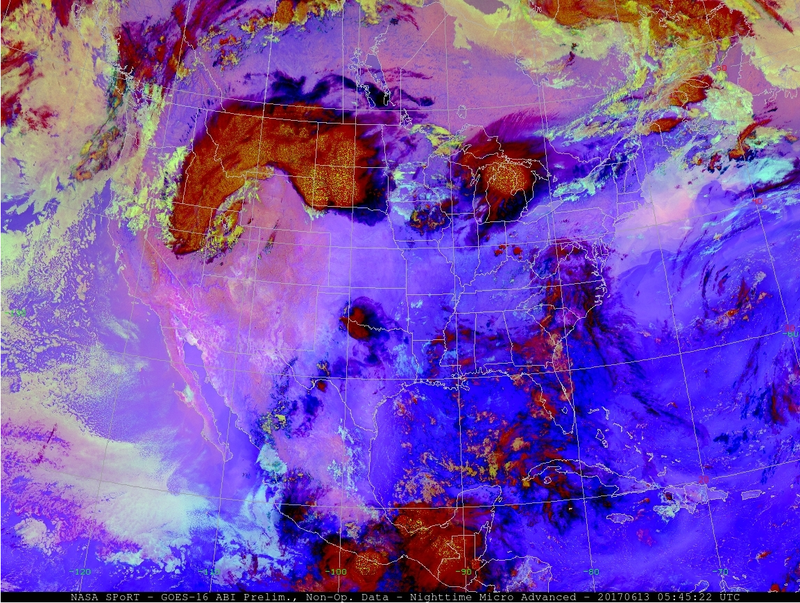 Thus, computed brightness temperature values are colder using 3.9 µm radiation than 10.7 µm radiation over water clouds. 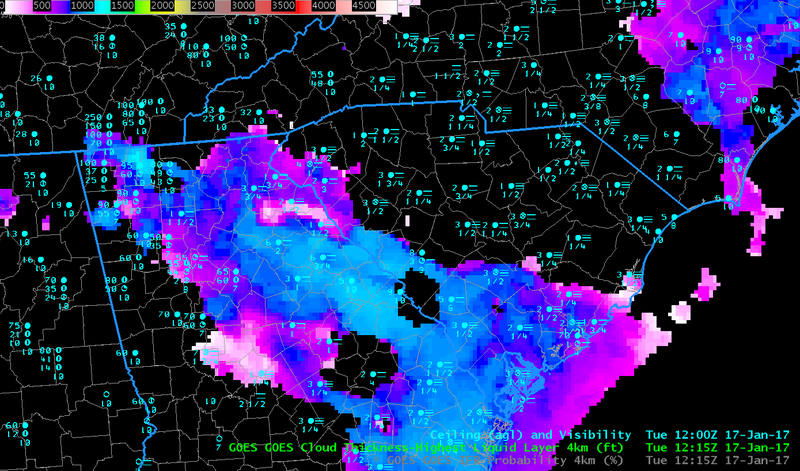 In the animation below, Brightness Temperature Difference values cooler than -1 C are highlighted in yellow. Note that High Clouds in the animation below over the Smoky Mountains prevent an accurate depiction of low clouds formation there. IFR Probability fields, at top, include a signal in that region because model data from the Rapid Refresh model suggests saturation is occurring. As the sun rises, at the end of the animation below, increasing amounts of reflected 3.9 µm radiation cause the brightness temperature difference field to flip in sign. In contrast, the IFR Probability fields, at top, maintain a coherent signal through sunrise. Alert readers may note that Brightness Temperature Difference fields and IFR Probabilities are not shown from 0400 UTC. At that time, Stray Light signals were present in the Brightness Temperature Difference field and they contaminated both the Brightness Temperature Difference and the IFR Probability fields. GOES-16 is transmitting non-operational data that are undergoing testing and refinement. The toggle below shows the brightness temperature difference field from GOES-16 and GOES-13 for one time on 25 April. Note the superior resolution in the GOES-16 data: 2 km at the subsatellite point vs. 4 km for GOES-13. As noted at the start of this blog post, GOES-R IFR Probabilities are being computed with GOES-13 and GOES-15 data, not with GOES-16 data. Incorporation of GOES-16 data into the algorithm will occur near the end of 2017. This entry was posted in Southeast on April 25, 2017 by Scott Lindstrom. 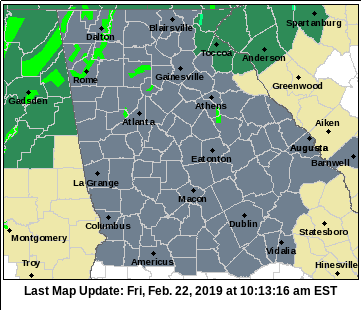 Dense Fog Advisories (National Weather Service Website) and IFR SIGMETs (Aviation Weather website) were issued early in the morning for dense fog over the southeastern United States. The toggle above from 1115 UTC on 17 January shows the Brightness Temperature Difference field (3.9 µm – 10.7 µm), the GOES-R IFR Probability Field, and the GOES-R Cloud Thickness fields associated with this dense fog event. Note the presence of high clouds over northern South Carolina and western North Carolina — the dark region in the Brightness Temperature Difference enhancement — prevents the brightness temperature difference field from highlighting that region of reduced ceilings/visibilities. The GOES-R Cloud Thickness field is not computed under cirrus either, as it relates 3.9 µm emissivity of water-based clouds to cloud thickness (based on a look-up table generated using data from a SODAR off the West Coast of the United States). If cirrus blocks the view, then, neither the Brightness Temperature Difference field nor the GOES-R Cloud Thickness field can give useful information about low clouds. In contrast, the GOES-R IFR Probability field does give useful information in regions where cirrus clouds (and low clouds/fog) are present — because Rapid Refresh information about the lower troposphere can be used. IFR Probability values will be smaller in those regions because satellite predictors are unavailable, and the Probability incorporates both predictors from satellites and from Rapid Refresh model output — if the satellite predictors are missing because of cirrus, the IFR Probability values will be affected. Despite the smaller values, however, the IFR Probability fields in regions of cirrus are giving useful information for this event. GOES-R Cloud thickness fields can be used to estimate Fog dissipation using the last GOES-R Cloud Thickness field produced before twilight conditions at sunrise (shown below for this case). (GOES-R Cloud Thickness is not computed during twilight conditions because of rapidly changing 3.9 µm emissivity related to the reflected solar radiation as the sun rises, or as it sets). This scatterplot gives the relationship between thickness and dissipation time after the Cloud Thickness time stamp (1215 UTC in this case). In this case, the thickest fog is near Athens GA; the algorithm predicts that clearing should happen there last, at about 1515 UTC. This entry was posted in Multiple Cloud Layers, Southeast, Uncategorized on January 17, 2017 by Scott Lindstrom. Light winds and a long November night allowed radiation fog formation over much of the deep south early on 25 November 2016. (1200 UTC Surface analysis is here). 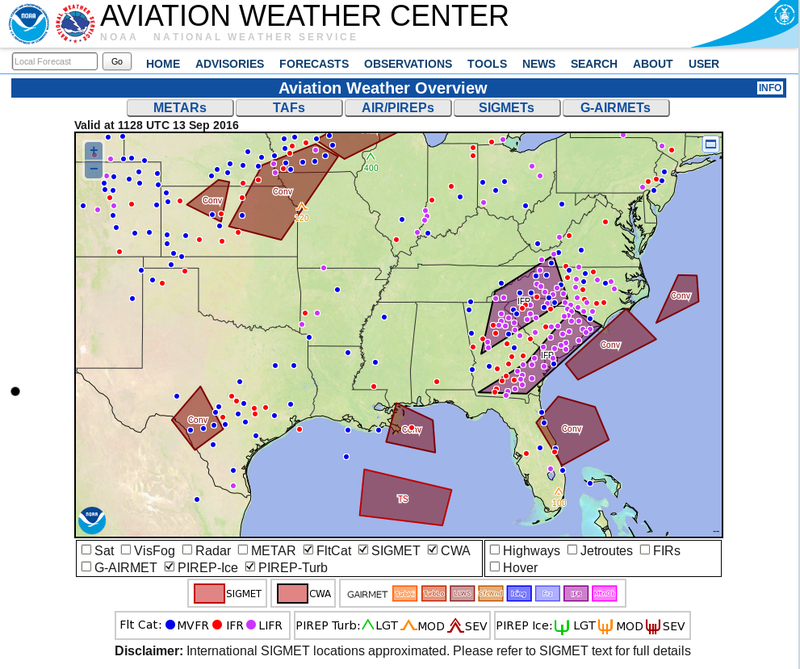 The Aviation Weather Center Website indicated widespread IFR Conditions, below, over the south, with the sigmet suggesting improving visibilities after 1400 UTC. The animation above shows the evolution of the GOES-R IFR Probability fields from just after sunset to just after sunrise. 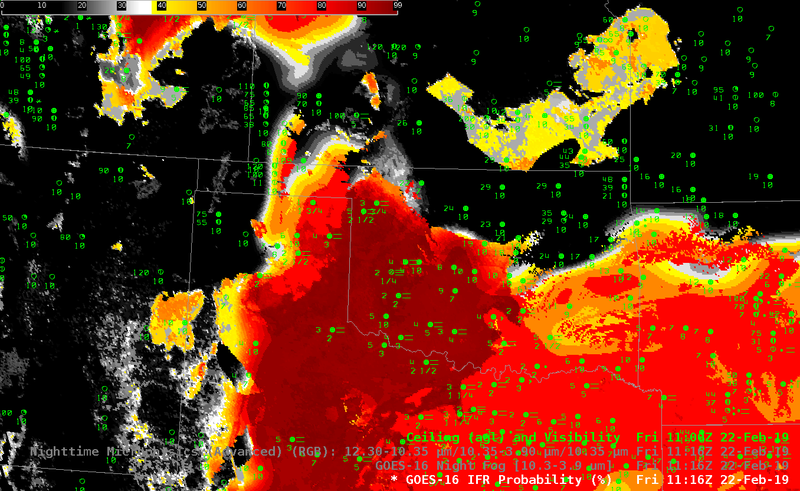 There is a good spatial match between observed IFR conditions and the developing field. IFR Probability can thus be a good situational awareness tool, identifying regions where IFR Conditions exist, or may be developing presently. 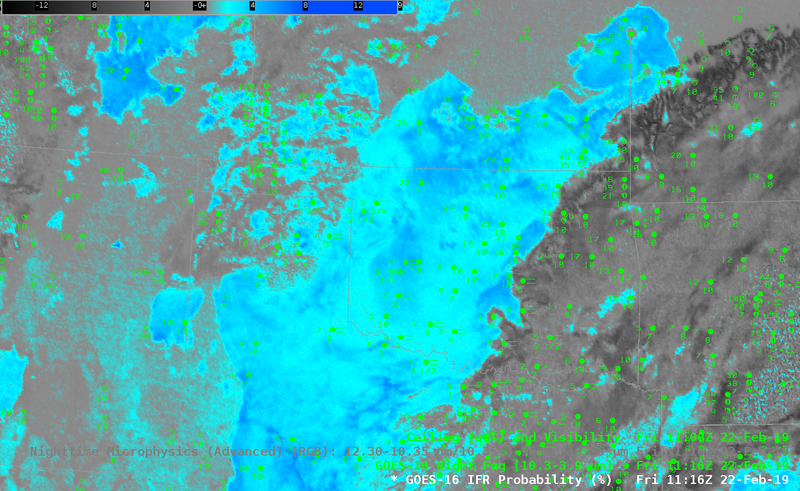 Did the GOES-13 Brightness Temperature Difference Field identify the fields? The animation below, from 0200-1300 UTC, shows a widespread signal that shows no distinguishable correlation with observed IFR conditions. Note also how the rising sun at the end of the animation changes the difference field as more and more reflected solar radiation with a wavelength of 3.9 µm is present. In addition, high clouds that move from the west (starting at 0400 UTC over Louisiana) prevent the satellite from viewing low clouds in regions where IFR conditions exist. 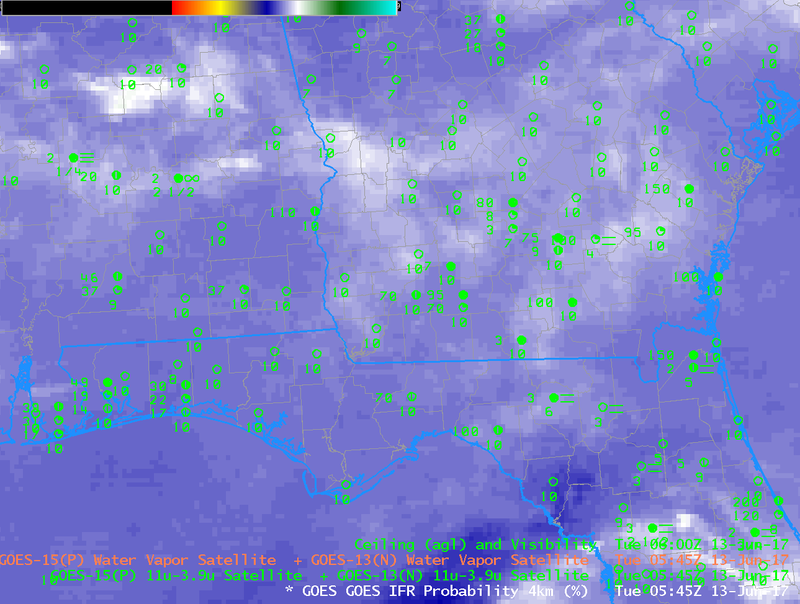 The high clouds that prevent satellite detection of low clouds, as for example at 1100 UTC over parts of Alabama, cause a noticeable change in the IFR Probability fields, as shown in the toggle below. Values over the central part of the Florida panhandle are suppressed, and the field itself has a flatter character (compared to the pixelated field over southern Georgia, for example, where high clouds are not present). Even though high clouds prevent the satellite from providing useful information about low clouds in that region, GOES-R IFR Probability fields can provide useful information because of the fused nature of the product: Rapid Refresh information adds information about low-level saturation there, so IFR Probability values are large. In contrast, over southern Florida — near Tampa, for example, Rapid Refresh data does not show saturation, and IFR Probabiities are minimized even through the satellite data has a strong signal — caused by mid-level stratus. 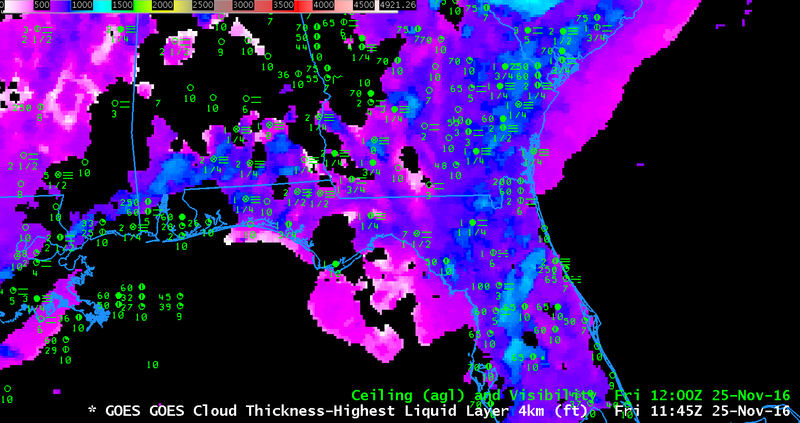 Soundings from Tampa and from Cape Kennedy suggest the saturated layer is around 800 mb. GOES-R Cloud Thickness, below, related 3.9 µm emissivity to cloud thickness via a look-up table that was generated using GOES-West Observations of marine stratus and sodar observations of cloud thickness. The last pre-sunrise thickness field, below, is related to dissipation time via this scatterplot. The largest values in the scene below are around 1000 feet, which value suggests a dissipation time of about 3 hours, or at 1445 UTC. This entry was posted in Deep South, Dissipation Time, Multiple Cloud Layers, Southeast on November 25, 2016 by Scott Lindstrom. 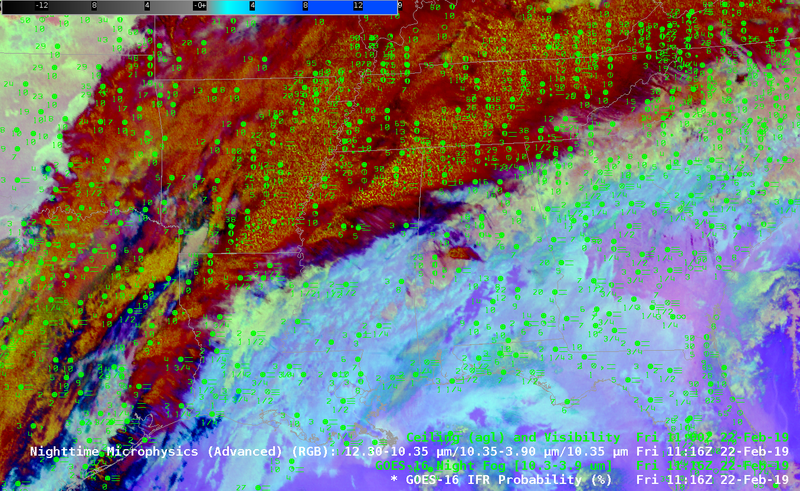 If you rely on satellite data alone to anticipate the development of IFR conditions — fog, low ceilings, and reduced visibilities — then the presence of widespread cirrus, shown here with the GOES-13 6.5 µm image, makes situational awareness difficult. At a glance, can you tell in the animation of brightness temperature difference, above, hourly from 0215 through 1215 UTC, where IFR Conditions are occurring? The widespread cirrus, present in the enhancement as dark grey and black, prevents the satellite from viewing any fog development, hence making this brightness temperature difference field, traditionally used to detect the development of fog and low stratus, unsuitable for large-scale situational awareness. GOES-R IFR Probability fuses satellite data with Rapid Refresh Model output and allows a product that in essence peeks beneath the cirrus because near-surface saturation predicted in the Rapid Refresh Model allows the IFR Probability product to have a strong signal where fog might be developing. Consider the animation below, that covers the same spatial and temporal domain as the brightness temperature difference animation above. IFR Probability increases over inland southeast Georgia in concert with the development of low ceilings/reduced visibilities. It gave a few hours alert to the possibility that IFR conditions would be developing. Note in the animation below that the 1215 UTC image includes IFR Probabilities computed using daytime predictors and nighttime predictors. 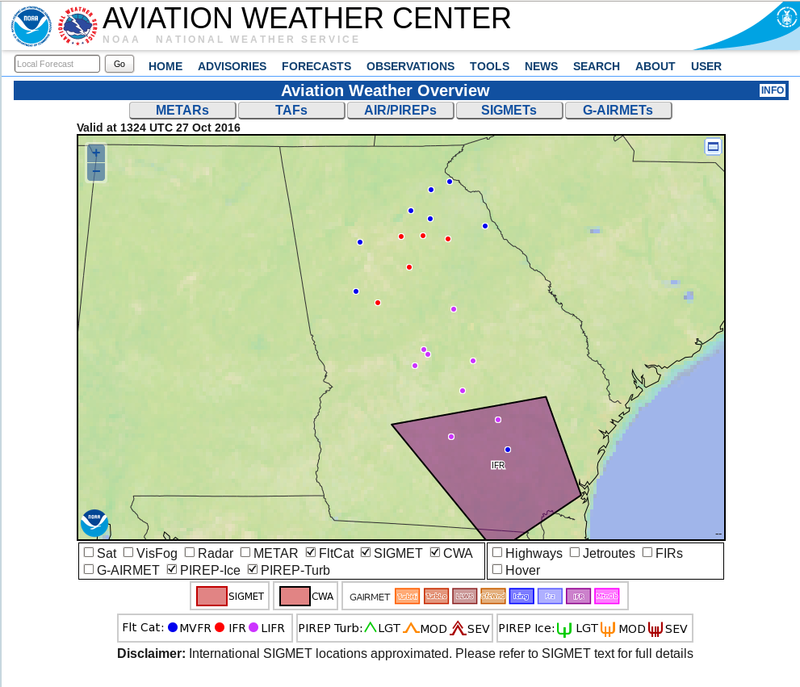 There is therefore a discontinuity in the field values over central Georgia at 1215 UTC, the end of the animation. Compare the animation below to the one above. Which yields better situational awareness for the developing fog field? 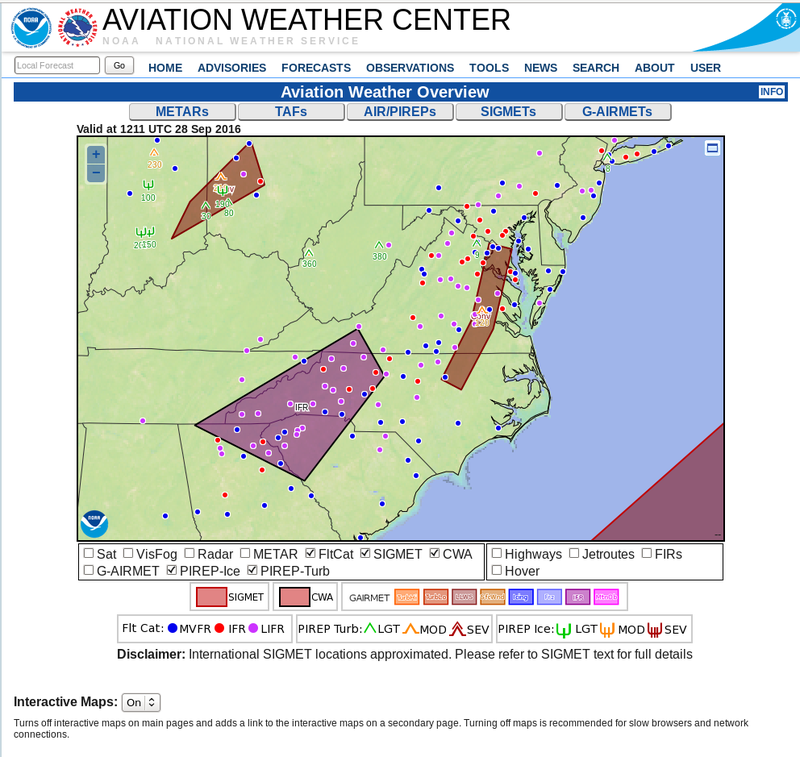 The Aviation Weather Center plot (below) highlights the presence of an IFR SIGMET over the region at 1324 UTC on 27 October. This entry was posted in Deep South, Multiple Cloud Layers, Southeast on October 27, 2016 by Scott Lindstrom. GOES-R IFR Probability fields often to a better job (compared to brightness temperature difference fields) in outlining exactly where low ceilings and reduced visibilities are occurring because IFR Probability fields include information about low-level saturation from the Rapid Refresh model. That information about near-surface saturation allows the IFR Probability algorithms to screen out regions where only mid-level stratus is occurring. A low fog — a stratiform cloud of water droplets that sits on/near the surface — and a mid-level stratus deck (also a stratiform cloud of water droplets) can look very similar in a brightness temperature difference field. 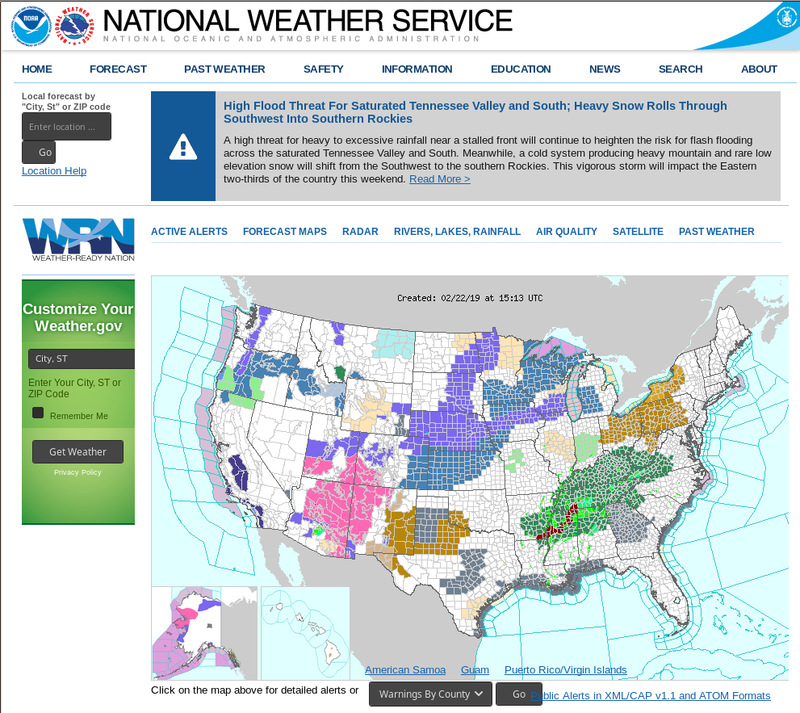 In the example above, consider much of northeastern Alabama and northern Georgia. There is a strong return in the brightness temperature difference field because mid-level stratus is present — but IFR Probabilities are small because the Rapid Refresh does not diagnose low-level saturation in the region. Compare Brightness Temperature Difference returns over northeast Alabama and over extreme western North Carolina — to the west of Asheville. 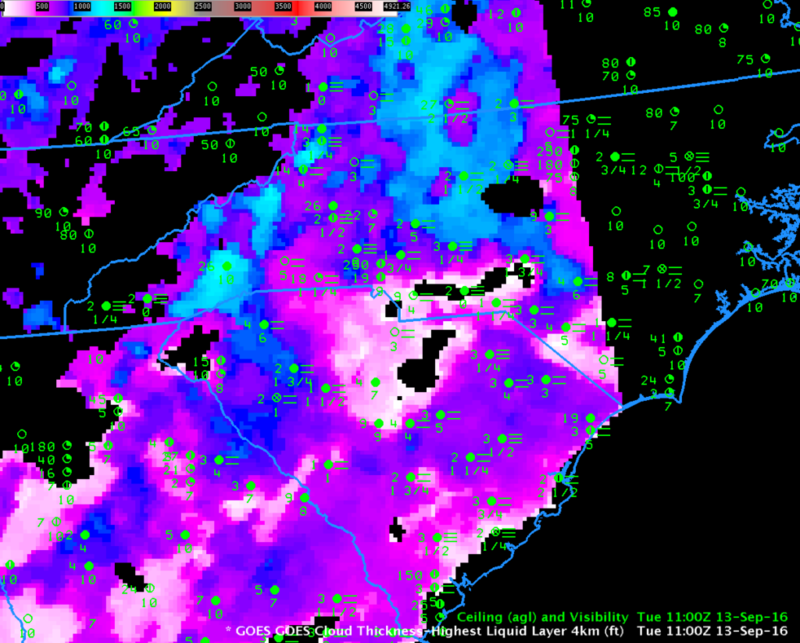 IFR Conditions are observed over western North Carolina, and IFR Probabilities are high there. In general, the region with high IFR Probabilities in the toggle above includes stations that are reporting IFR or near-IFR conditions. Most stations outside the region of high IFR Probability are not showing IFR Conditions, even though they may be in a region with the Brightness Temperature Difference signal is large. A similar story can be told farther west at 0800 UTC, shown below. 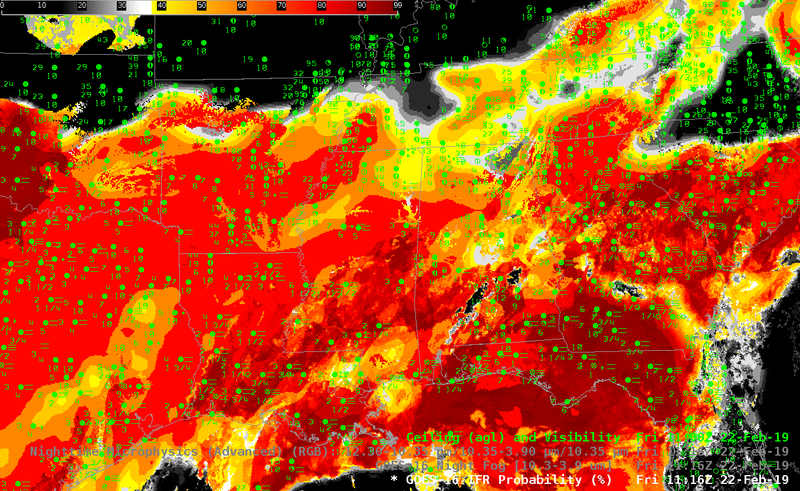 Focus on the region with a strong Brightness Temperature Difference signal over southeast Arkansas. 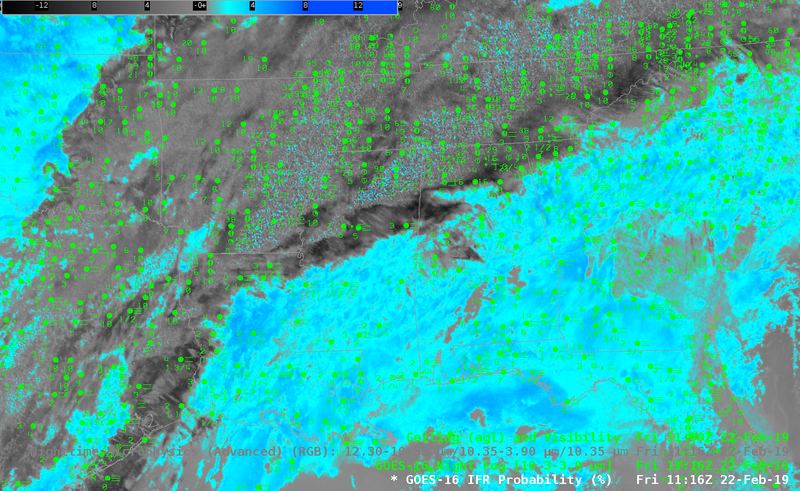 IFR Conditions are not occurring under that mid-level stratus deck, and IFR Probabilities are very low. 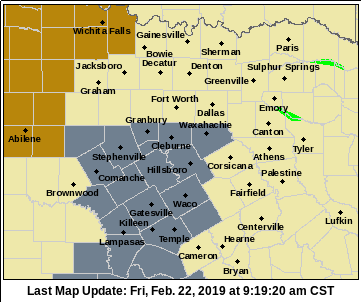 Similarly, IFR Probabilities are small over Oklahoma and north-central Texas because the Rapid Refresh Model is not showing low-level saturation in those regions; IFR Probabilities cannot be large when low-level saturation is not indicated in the model. Using both Satellite Data and Model Data accentuates the strengths of both. That’s the power of a fused data product. This entry was posted in Deep South, Multiple Cloud Layers, Southeast on October 18, 2016 by Scott Lindstrom. Because GOES-R IFR Probability fields are computed with the same time latency as GOES imagery, motion of the IFR Probability fields can have predictive value. 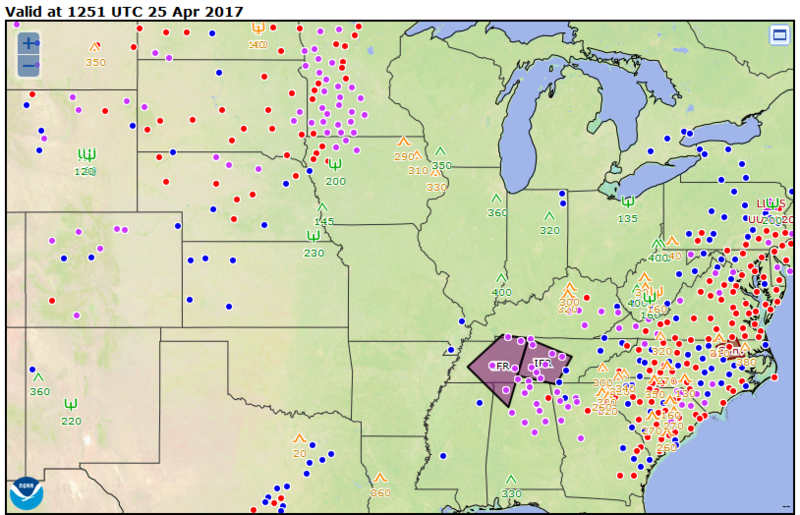 In the animation above, higher GOES-R IFR Probability is moving eastward; IFR Conditions are reported as the higher IFR conditions move overhead (consider, for example, Bowling Green, KY, or Clarksville, TN), and ceilings / visibilities improve as the band of higher IFR conditions moves eastward from a station (over southern Illinois, for example). This entry was posted in Midwest, Plains, Southeast on October 13, 2016 by Scott Lindstrom.